All of the A100 Series Anemometers manufactured by Vector Instruments utilise a highly sensitive yet robust 3-cup rotor from our R30 series. Manufactured from weather-resisting plastics, anodised aluminium and stainless steels, each rotor is individually calibrated in our own wind tunnel at one windspeed (9m/s) by comparison to one of a set of reference rotors which are themselves independently calibrated and traceable to international standards. Most other manufacturers do not offer any individual calibration as standard. The R30 series rotors are fixed to the anemometer using a unique gravity-sensitive fastener which does away with the need for any rotor clamping screws, making it easy and quick to fit/remove, but ensuring it stays securely fitted while in service. The standard rotor is available as R30K, R30M and R30S which have different calibrations and are for use with different anemometer types. 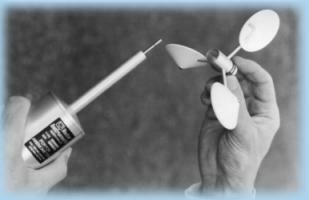 While rotors are physically interchangeable between all anemometer types, it should be ensured that the correct calibration/type is used with an anemometer to guarantee that the rated signal is output by the anemometer. As a rule, it is advisable to keep anemometer/rotor pairs together (anemometer/rotor pairs are identified by labels on the boxes when the items are shipped). NEW: A �Severe Environment� ( /SE ) option is now available for the First Class A100 Series Anemometers for applications where extra measures are necessary to improve performance/reliability in extreme conditions. The well proven First Class R30 rotor has been subtly refined to produce a variant which retains all of the external features/dimensions of the original R30 rotor and therefore maintains it's First Class performance characteristics. The subtle rotor refinements are designed to enhance operation and reliability in arduous conditions, and together with additional improvements to the anemometer body shell sealing the �/SE� option is an ideal choice for A100 Series Anemometers which will be used in Severe Environments where First Class performance is required together with high accuracy and reliable performance, such as in Offshore Wind Assessment or Wind Turbine Control applications. If required, it is possible for our factory to convert most existing instruments to the /SE option specification as part of a repair/refurbishment program. Before the availability of the /SE option, "Marine" ( /WR ) versions of the R30 series rotors were available which used non-standard rotors designed to reduce the likelyhood of ingress of sea/salt water and/or sand/dust (e.g. R302) - For reference, some of these non-standard rotors are shown below, however these non-standard rotors are not recommended for new installations/instruments - see the /SE Option instead - the /SE option is likely to outperform the older /WR (marine) versions while also maintaining First Class characteristics. Rotor fitting/removal instructions are available in the "Help..." section. Page Rendered in: 0.585135 seconds. - Powered by Mambo.